We would like to thank everyone for supporting us! We have been getting a good bit of traffic over the past few weeks. Don’t hesitate to continue to keep liking and sharing are posts and ads on our pages. Your support is what makes this community grow. Some people don’t like to share items related to income taxes. But based on how many delays and problems that happened last year. And the IRS having major layoffs and nobody can ever get through to get answers to questions. Many U.S. taxpayers have questions with many new forms, laws, error’s, etc. We need a community where people can come together and share problems they are having and get answers from others that may have had the same problem. We would like you to join and follow all of our communities. Based on 2015’s Long Tax Season with multiple delays, layoffs and many still waiting for last years refund. This tax season may be as bad as last year and you may have questions you need to be answered. Feel free to bookmark this community and come back to ask questions or answer some. Please like and share this post below to help us determine where we stand at today! Come join our brand new website for the 2016 Tax Filing Season. Connect with Us! using the Login App in the bar on the upper right-hand corner of the page. This will give you access to the forums to ask questions and share all the important information you have. Your support is what makes this community grow. The information everyone takes part in sharing this year on RefundTalk.com will be a footprint to look back on in years to come for important information. Please start posting all your important information and questions in our Discussion Forums! 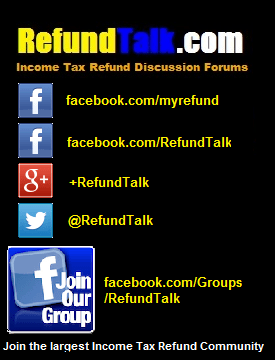 Thank You Very Much for your Support and Please Continue to Follow and Share are Income Tax Refund Updates! *If you would like to see more posts like this please feel free to Support Refund Talk on Facebook, Google+, Twitter, Delicious, and Reddit.